Appearance: The feather is depicted as a tall ostrich plume whose tip bends over under its own weight. Meaning: The feather, because of its name, "shut", was a symbol of Shu. 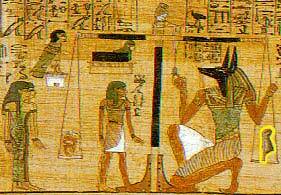 Shu was the Egyptian god of the air and the father of the earth (Geb) and the sky (Nut). Shu was often shown wearing a feather in his hair. Occasionally Geb was shown dressed in feathers, a representation of the air which covers him. During the feast of Min, men would erect a ceremonial pole. These men would wear four ostrich feathers on their head. The significance of the feather in this context is uncertain.